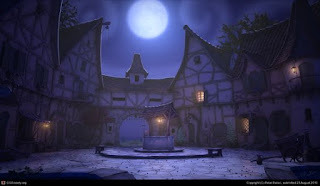 Under the cover of a moonless night, Grabby set off with Boots from the inn through the drizzle to Gower's home in search of the mysterious "arcane aura" from the nearby house. Once there, Boots hid himself in a nearby alley while Grabby kept to the allies behind the manor house. Audrey went out to feed Gerald the horse, only to have him stomp on her foot, sending her limping back to her inn room for the rest of the night (this is also why Audrey's player was away tonight). After the previous day's theft, security was heightened: two pairs of sentries circled the perimeter, one stood guard on a second floor balcony, and three more walked the yard with a pair of mastiffs. Grabby was able to slip between the shadows and silently secure a grappling hook to the manor's roof and scale to the top without being noticed. He crested the peak of the roof, and in the darkness was just barely able to make out the shape of a large, 30 pound iron key wedged between the roof and the chimney. Unbeknownst to him, Grabby was being watched by Boots' imp familiar, Yattering, who circled silently high above. He carefully picked it up the key, and rather than try to fit it into his pack, it might be best to toss the key over the top of the roof and down into the alley below, where the mud and garbage of the alley—additionally softened by the light rain—should stifle the sound of the key landing. With a mighty heave, Grabby launched the key over the peak of the roof... and came up short. The key landed on the roof's shingles, breaking some and sending others sliding down the steep roof. The key itself loudly slid down the roof and came to rest on a gable. This, of course, alerted all the guards that something was afoot. Thinking fast, Boots sent his imp to fly to a nearby home in the opposite direction, materialize and start throwing tiles off to create a diversion. Soon the mastiffs were barking, the guards in the front ran to see the commotion that was happening caused by the imp, while two more headed to the alley to see what the initial disturbance was. After quickly stuffing they key into his pack, Grabby cast a minor illusion of a woman in the alley below him to distract the guards. Sure enough, they saw her and called after her and began to pursue her. One guard kept on the pursuit, while the other stopped when he noticed the rope dangling from the roof. Having to move from its rooftop cover, Yattering flew into view over the shocked guards. Dropping their spears and pulling up their crossbows, the stunned guards scrambled to fire at the small demon now fluttering overhead. Stunned by the sight of the demon, another guard in the yard ran for the alarm bell and began ringing it madly. 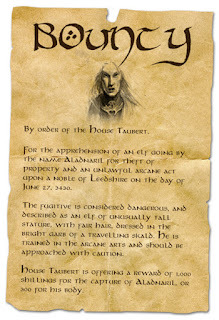 Unfortunately for Yattering, the sentry posted on Gower's balcony was already armed with crossbow and fired a bolt which landed squarely in the imp's chest, nearly killing him. Calling Yattering back to safety and to once again become invisible, Boots began to move down the darkened alley away from the action, all the while listening to the imp's curses telepathically. At this point Grabby had to keep moving to get away from the commotion, from the din of the guards, dogs and the alarm bell, lights from within homes nearby began to flicker to life, and the yells of watchmen echoed down the vacant streets. He leaped down to the street below, tumbling prone. Once he was back on his feet he made a dash across the street to another alley—hastened by the sound of a guard yelling, "Go get 'im!" and the sound of a barking mastiff breaking into a run. The Yattering safely back with his master was quickly banished for the time by Boots as he slinked back to the inn to return to his allies while Grabby was left to fend for himself. Charging down the dark alley, Grabby managed to find a pile of garbage against a wall that he dove into and proceeded to cover himself in filth and refuse to hide from the angry mastiff and his handler. Luckily, the stinking garbage and darkness shielded Grabby as the mastiff ran down the alley and past the halfling. Not wanting to take any chances, Grabby continued to lie in the pile of filth for an hour until the commotion died down, occasionally having to brush rats away that were crawling over him to find a meal. Eventually he pulled himself up from the rain soaked pile of trash and mud and made his way back to the inn. Once safe inside the inn he was quickly kicked out and told to wash off in the stables—inn keepers don't take kindly to soaking wet, garbage encrusted halflings. The rest of the party went out to find Grabby stripping down and washing himself in a horse trough, triumphantly telling them the story of how he found the key they were after, and claiming to even sense a "magical aura" emanating from the rooftop (this was role played, and strengthened further by possibly a D&D first—Grabby failed an insight check against his own deception roll to see if he truly believed that he saw a magical aura). Confused by Grabby's ability to sense this arcane force, and fact that the very key they were after was mysteriously planted on a rooftop, the party had a better idea what was going on when Grabby blurted out, "I sensed the magical aura, just the same as Mr. Boots!" 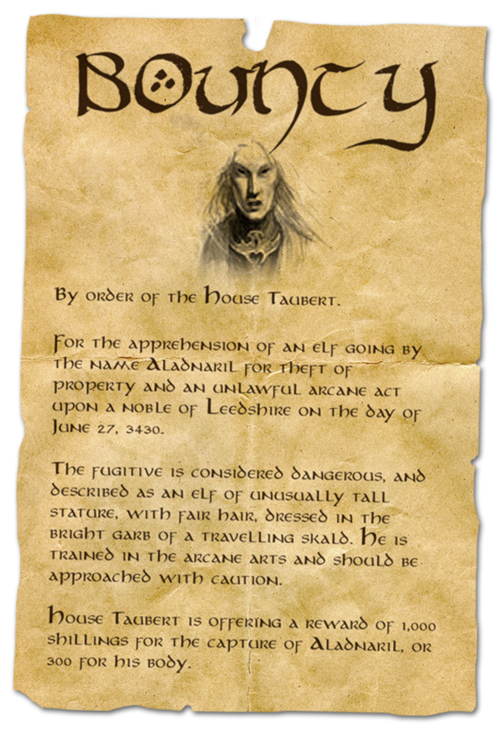 In addition, Ander had recently checked a bounty board to look for any new postings and found a fresh bounty for Boots posted, which he brought back to the inn.